Wholesale Personalized Presentation Folders Custom Printed or Debossed. Promotional, Inexpensive, Padded. Budget Prices in America. Bulk Presentation Folders - Portfolios, Personalized with Custom Imprint or Custom Debossing. Budget Prices in the USA and Canada for wholesale personalized presentation folders. Our bulk personalized folders are made of premium quality leather-imitation vinyl (leatherette), and include a free writing pad. Unit prices below include your 1-color custom imprint. Add the amount shown for extra imprint colors, or for debossing. Free artwork design. We will send you a proof for your approval before production. US clients pay no taxes. 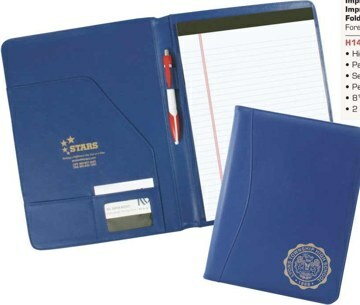 Folder Size (WxH): 91⁄2" x 125⁄8"
Colors : Black, Burgundy, Forest Green, Navy Blue, Royal Blue (see photo).